With holiday travel, the risk of an accident or ticket grows. More police officers will be patrolling to prevent accidents and dangerous driving. 50 percent of traffic stops result in the issuance of a ticket, and some violations may mean that you will not be able to get to Grandma’s house safely. To reduce your chances of an accident or ticket, follow these five tips. Malfunctioning lights are the prime reason for traffic violations. Before heading out, check for properly functioning brake lights, turn signals, and headlights. If lights flicker, the bulb needs to be replaced. If this does not correct the problem, the fuse may need to be replaced. A small metal clip squeals to identify bad brakes. Continued driving on bad brakes will break the clip off and result in brake failure. Look through the tires at the brake clamps and the brick-like pad (the brake pad) under the clamp. If the pad is less than one-third inch in depth, have the brakes replaced. If the shiny, metallic disk is jagged or contains deep grooves, the brake system could need further repair. Underinflated tires and poor tread depth cause more than 11,000 accidents yearly. Furthermore, underinflated tires waste gas and cause prematurely wear down tire tread. Drivers can check tire tread depth by placing an upside-down penny in the track. If Lincoln’s head is visible, the tires need to be replaced. Additionally, drivers should manually check tire pressure with an air pressure gauge weekly and before long trips. All tires have the appropriate tire pressure on the sidewall. Salted, wet roads result in clouded windshields, which further hinder a driver’s safety. Drivers should refill the windshield wiper reservoir with a a sub-zero windshield cleaner biweekly. Furthermore, antifreeze, which provides warmth for the heater and keeps the engine functioning, should be checked every week. Antifreeze helps provide warmth for the heater. Antifreeze levels should be checked at least once per week during winter months. Any amount of alcohol in the blood could result in a ticket for driving under the influence (DUI). The National Highway Safety Administration advises any drinking and driving. Even if a driver feels fine, he or she may be over the legal limit. Everyone’s body processes alcohol differently, and a driver who has only had one drink should find another person to drive. It could save someone’s life. 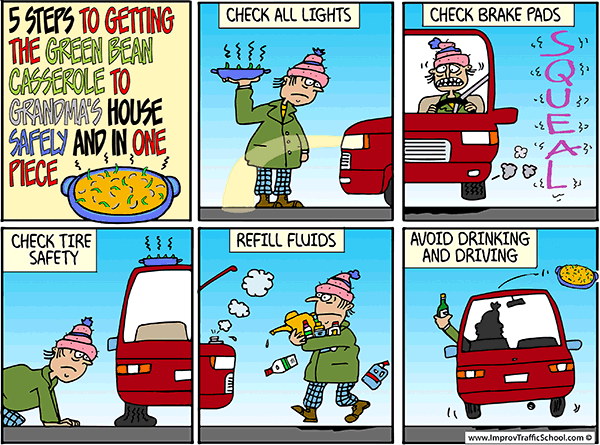 If you want to get the green bean casserole to Grandma’s house safely, you need to follow these five tips. The vehicle and the driver need to be in the best condition for driving. Driving a malfunctioning vehicle, drunk driving, and even drowsy driving make up some of the top causes of traffic stops and accidents during this time of year.